Monday August 7th 1922 I helped Lizzie some with the work and wrote Warner McCall. Letter from Cora. Slept in PM. After supper Lizzie walked up town. Tuesday August 8th 1922 Did some washing for myself. Slept in PM. Wrote to Bro Ott. After supper Lizzie and I called at Mr Burtons. Wednesday August 9th 1922 We were home all day. Wrote Maurice Culbertson. I slept in afternoon. A gentle rain set in. Read in evening. Thursday August 10th 1922 It rained part of the day. Wrote Tishie Hedges. Had a letter from Laura Mason. We were up town in PM. Friday August 11th 1922 I made tatting. Lizzie not very well. I wrote Hattie. I was up town in afternoon. A showery day. Very much needed. Saturday August 12th 1922 I sewed in AM. Slept in afternoon. A letter from Hattie tells me Lorie Foltz is dead at Los Angles. She was to be buried on The Hartsock lot at Hollywood. Poor Lorie. She will not be there to see me when I reach Los Angels. Sunday August 13th 1922 Lizzie and I made a call in AM. Were invited out to 5 oclock dinner. I wrote Mattie Stitt and Mrs Falk. Evening at home. 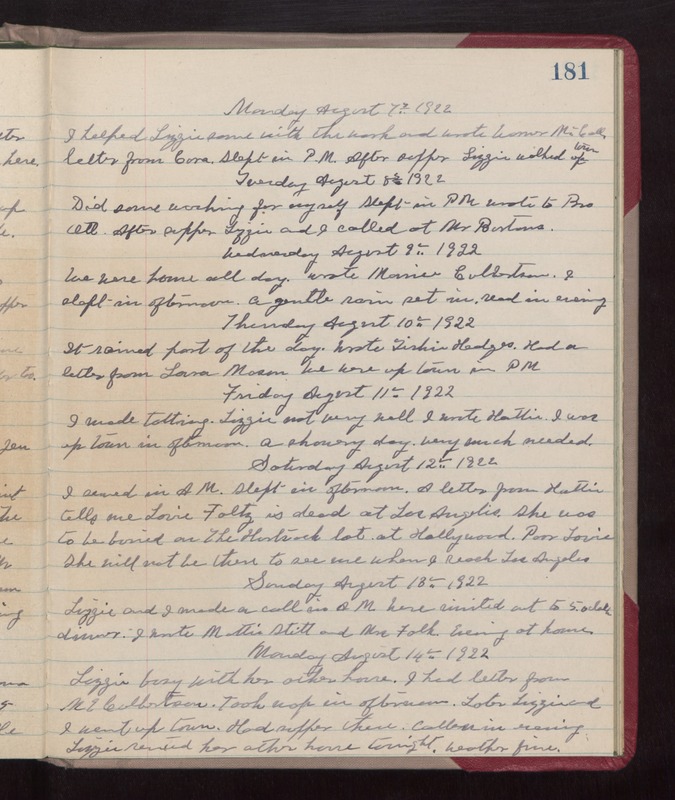 Monday August 14th 1922 Lizzie busy with her other house. I had letter from M E Culbertson. Took nap in afternoon. Caller in evening. Lizzie [rented?] her other house tonight. weather fine.